The ProRent Plywood Folding Table is perfect for your professional meeting areas, libraries, or study rooms. They are a popular choice for these types of indoor venues; you've probably seen them somewhere before! This table comes in a few different shapes and sizes, so you can get the perfect size for your needs, whether it be as a classroom table or a foyer table. You can also find many more uses for the ProRent Folding Table, if you only open your mind to the possibilities. Folding legs make set-up and tear-down a cinch! The legs lock securely in place, so the tables hold fast. We have You won't have to worry about the corners either, because McCourt carries corner replacements for the tables! 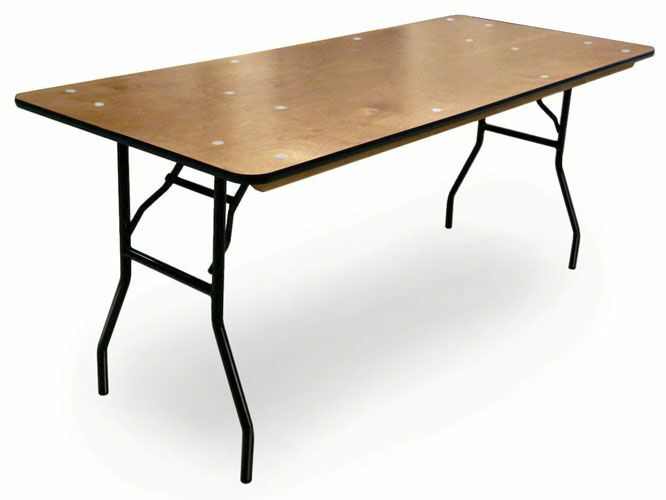 McCourt also offers a 2-year warranty* on the ProRent Plywood Folding Table because we are so confident in the quality craftsmanship of our tables. Order McCourt's durable tables today! Just call 479-783-2593 or call toll-free at 800-333-2687! *Full 2 year limited warranty against manufacturing defects under normal use. McCourt Manufacturing will repair or replace (at our option) at no charge; customer assumes all freight charges. Replace vulnerable corners with our exclusive SuperCorner insert. Transforms rectangle tables into stronger and longer lasting tables! 3/4” plywood of a minimum 11 ply board with no splices, voids or plugs. Both sides of top shall be stained a medium oak color then PolyCoat finished with a thickness of 3 mils on top and 1.5 mils on bottom surfaces. Rails are made of solid hardwood and have no finger joints or other splices. Rails have counterbored through-bolt mounting and stained to match the top. Wishbone style folding legs are constructed of US steel with full welds on 16 gauge 1” tubing and 11 gauge stamped steel brace. Detent leg locks securely in the fully open and fully closed positions. The complete leg assembly is cleaned with industrial cleaner for rust resistance and superior paint adhesion. Baked-on polyester powder coating has outstanding toughness, excellent weathering properties and a smooth appearance. Through-bolt attachment of rails and folding legs ensures strength and durability. SuperCorner - ABS plastic insert reinforces corners to guard against corner damage. Available on rectangle tables only. Aluminum SuperEdge - smooth wrap around T-style edging for greater edge protection.